KSHE-95 presents Monsters of Mock – the greatest concert that never was! Don’t miss an evening of premier tribute bands paying homage to some of the greatest names in the history of rock. 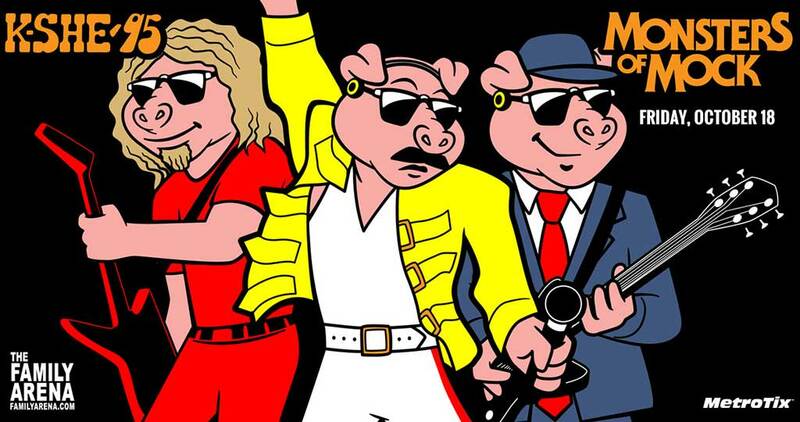 This year’s lineup includes Killer Queen: A Tribute to Queen, Red: A Tribute to Sammy Hagar and AZ/DZ: A Tribute to AC/DC. It’s a night full of rock anthems and ticket prices start at just $30. Killer Queen formed back in June 1993. Queen's music is loved the world over. Their songs have inspired generations. Recreating the songs on a world stage takes a great deal of skill, and Killer Queen's musicianship is outstanding. During their various careers the musicians have worked and recorded with a vast array of artists including Roger Taylor, Brian May and Monseratte Caballe. By 1995 Killer Queen's UK popularity had grown to such an extent they secured a residency in London's Strand Theatre attracting nationwide BBC coverage - the first tribute to have a show in the West End. Based in St. Louis MO, RED was conceived in 2011 by a group of dedicated local musicians. Their goal is to pay tribute to one of the greatest rockers in rock and roll history - Sammy Hagar. His music has spanned over 4 decades and his concerts have evolved to the party we all know as a Sammy Hagar Concert. Their love for the music of Red Rocker inspired this project. RED’s goal isn’t to BE Sammy Hagar but to create the same type of atmosphere that you would find at a Hagar Concert. When you see an AZDZ show, you are guaranteed to hear all of the hits: "Back in Black," "Hells Bells," "Shoot to Thrill," "Thunderstruck," "T.N.T.," "Dirty Deeds Done Dirt Cheap," "If You Want Blood," "Problem Child," and of course the most popular rock sing-along, "You Shook Me All Night Long." Striving to bring you the very best sound, performance and concert of AC/DC, the school boy outfit of Angus, the bells in "Hells Bells" and the cannons in "For Those About To Rock" are just a few things to expect from the Ultimate tribute to the greatest Rock and Roll band, AC/DC. Children under are 2 free when seated on adult's lap. Parking is not included, and will be $10 (regular) or $20 (VIP) upon arrival.